The British railway network encompasses 9,820 route miles and 2,557 stations that must all be inspected on a regular basis to ensure it runs smoothly. Previously, this has involved performing manual after-hour inspections that limit the operation of overnight trains. 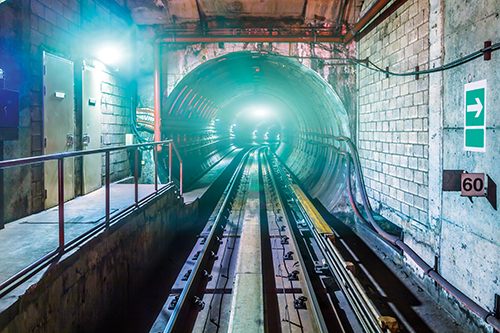 Now, however, thanks to imaging technology that can be attached to passenger trains, dedicated inspection trains and aerial drones, track and station monitoring can be performed throughout the day without causing disruptions. Stemmer Imaging has been working with the London Underground since 2015 to develop industrial camera assemblies that can be mounted directly onto passenger trains, enabling them to capture optical imaging data of the track ahead and the interface of the wheels and track as they operate. Such systems allow the London Underground to spend its night closure period more efficiently, making necessary repairs rather than inspecting the 1,000km of track it uses. ‘The London Underground previously had to have people walk along the tracks after the trains had shut down to check that nothing was wrong, this limits how long they can stay open for,’ explained Mark Williamson, director of corporate market development at Stemmer Imaging. ‘These inspection cameras allow them to record all the content they need during the day, so someone in an office can then effectively walk the line virtually on a computer monitor.’ Ultimately this has allowed the London Underground to minimise service disruptions and provide new extended weekend operating times. The passenger trains are equipped with two Genie cameras from Teledyne Dalsa that operate at 120 frames per second within the rugged camera assemblies provided by Stemmer Imaging. The cameras are housed alongside 40µs-pulsed LED illumination sources operating at 840nm, enabling high quality images to be taken by eliminating the relative movement between the camera and the track. As part of the project, Stemmer Imaging had to ensure that the shock and vibration of the train wouldn’t affect the camera. As a result, the camera enclosures supplied by Stemmer are shock rated to 5G, making them resistant to the continuous shaking of rail travel. By ‘walking’ the train lines in the video, image-by-image on a regular basis, the London Underground can identify any track debris or structure damage along its routes, enabling it to deal with problems as they occur. However, the data gathered by the passenger trains is purely optical; in order to obtain a full inspection of a rail route, other imaging technology must be used in parallel. Laser technology is used on inspection trains to obtain a profile of the base and rails below the train. ‘They are automatically looking for things like whether the clips that hold the track on to the sleepers are on correctly, or where the tracks are in relation to the gravel,’ said Williamson. Capturing this data requires a specialised 3D camera capable of interpreting laser triangulation data. ‘A laser points down alongside an area scan camera that extracts the profile to provide calibrated height data,’ Williamson explained. The inspection companies can then identify if the track profile conforms to a certain shape to determine whether the track has been worn or warped over time. Stemmer Imaging supplies Automation Technology’s C4 and C5 3D laser scanning cameras for this purpose. According to Williamson, Omnicon Engineering is working to map the entire rail network, looking for and indexing each current issue and asset on the line: ‘They look for instances such as “Are the clips on? Is the rail profile to the right quality? Is it wearing?” and they are feeding all of this information into a massive database. They can then go to a particular point on the network, view the data-extracting footage over time and then use analytics to see if any parameters have changed.’ For the inspection trains used in these applications, Stemmer Imaging provides Teledyne Dalsa’s line scan cameras. Stemmer Imaging also supplies forward-facing thermal imaging cameras as an overhead power line inspection tool. ‘They can identify hot spots,’ Williamson explained. ‘If faulty connections exist where high voltage and current leakage is present, excess heat is produced.’ Thermal cameras operating at 100fps tend to be used for this purpose. ‘We’ve done some good work with the Xenics Serval camera,’ commented Williamson. Modern inspection trains are able to run between 80 and 90 miles an hour due to the fast range of sensor technology now available. ‘With the latest generation of products there’s a lot of re-engineering going on to adopt the new CMOS sensors,’ said Williamson, who went on to say that data transmission rates are also improving: ‘They’re using high speed Camera Link at the moment, but there’s a redesign going on moving towards things like CoaXPress because they need even higher data rates.’ Before these sensors were available, inspection trains were limited to running at around 50 miles an hour, often forming a bottleneck that slowed the other trains travelling on the network. Certain aspects that need to be inspected along rail routes and in stations are often in difficult-to-access areas, such as the underside of a high bridge or the roof of an old station. Examining these areas previously required a team of workers operating elevation equipment either on or alongside the railway, preventing trains operating on the lines where inspections were taking place. Now, however, rail networks are turning to companies that specialise in using aerial drones equipped with imaging technology to carry out asset inspections. In 2014, Cyberhawk was one of four companies awarded a framework agreement by Network Rail, allowing them to operate aviation equipment on or near rail assets in the UK. Philip Buchan, commercial director of Cyberhawk, explained the two types of work it carries out as part of the agreement: ‘One is inspection, flying close to structures to capture close images that allow us to make engineering decisions and write inspection reports on their condition. The other is land surveying, flying over areas of land creating high-definition photographs looking directly down on the land, or three-dimensional digital terrain models showing the topography of the land.’ According to Buchan, more than 200 hectares of land can be surveyed a day using aerial drones. Through Cyberhawk, rail companies are also able to obtain overview images of their construction or refurbishment projects before, during and after they have been finished. ‘If they are thinking about building a new station or upgrading a section of track, then they’re going to want to know what the topography of the land is, we can provide this,’ said Buchan. Drones present numerous advantages over conventional inspection methods. ‘It reduces the need for people to work at height, which more people die from in industry than anything else,’ Buchan explained. ‘We can go up and understand the condition of something so that repair workers know exactly what they’re doing and what tools they’ll need as soon as they get up there, without having to go up and examine it themselves. ‘Another big advantage is that we don’t need to gain possession of the line in order to perform inspections,’ Buchan continued. ‘The drone can fly in to capture the data it needs and then fly off without needing a person to be on or next to the track.’ Using drones therefore removes any need to disrupt train lines when carrying out inspections using expensive scaffolding or elevation equipment. In London alone, 167 accidents involving a cyclist and either a lorry or a bus have occurred over the past five years, according to collision analysis website CrashMap, with 25 of these being serious or fatal. Britain’s transport minister admitted in 2012 that the uptake of cycling in the country was being held back by people being too scared to cycle on the roads. With this in mind Fusion Processing has developed the CycleEye, a single-piece imaging system that uses both optical imaging and radar to identify cyclists as they move alongside large vehicles. It then notifies the driver that a cyclist is close by with an audible alert such as ‘cyclist left’. The CycleEye therefore uses a combination of both radar and optical imaging to discriminate between cyclists and other objects. ‘Our algorithms run a range of metrics on the two data streams together, which then enable it to make a very accurate judgement on what the object is, where the object is and what the object’s speed is, so we can essentially track cyclists and notify their presence to drivers as they move into the dangerous zone alongside large vehicles,’ said Hutchinson. The radar’s long wavelengths ensure that a cyclist can be identified even in poor weather conditions, such as heavy snow or fog. ‘A camera on its own is seriously compromised, but when you add radar capability you get very accurate results,’ Hutchinson commented. The system features Fusion Processing’s own cameras that operate between 30 and 60fps and offer both standard and high definition resolutions. Hutchinson highlighted, however, that the most significant part of the system was the unique programming algorithms it uses to interpret the data sets.